TestimonialsWe're the best, find out why. 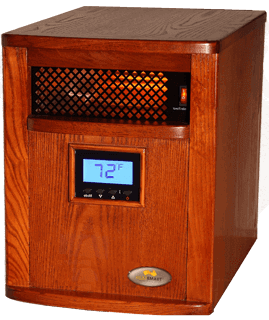 "This heater has a nice wood cabinet and is very easy to use. It is light weight and easy to move around to different parts of the house. I am very satisfied with this heater and I would buy another one." "I took it out of the box and I laughed there is no way that little thing can heat anything. We have 2 cold spots in our house, one is the upstairs the other is a sun porch attached to the kitchen that is all glass. We tried it upstairs this weekend and wow our whole upstairs has warmed up, never been this warm upstairs and we have it sitting in the foyer and it is heating the rooms too. We are going to take the heater downstairs to the sun porch to see the difference upstairs and see what it does in the sun room but i think you will have yourself a new dealer. Do you know where the closest store to me that sells these. Again very impressed so far. Thank you"
"5 stars to your company ! I love my heater! It is used to heat our entire basement during the winter months and does the job cheaper and better than the old oil heater. I bought a spare one when I bought this as I was so pleased with it and our electric bill. Thanks again." "My family purchased a Heat Smart (I believe a 1500) last winter just before Christmas. It worked great and we were very happy we purchased it." "We bought a heater in 2008 we love it and have told all our friends how great it is." "Thank you I got the heaters yesterday and have been bragging about what good service you provide to every one I have talked to. It is a pleasure knowing people still stand behind their products and all of America is not like wall street. Thanks again!" "I want to thank you for such FANTASTIC customer service you provided for me on our call today. Your information was right on point, the phone number and location in Seattle was polite and courtesy to deal. What made my day was that they recommended another location in Silverdale WA that repaired and just by chance tomorrow I am opening up a store in their area and made arrangements with them to have it repaired. So I want to say thank you much for your information and kindness."